You are currently browsing the tag archive for the ‘Wade Davis’ tag. Wade Davis is an anthropologist and ethno-botanist whose passion for unsung and underserved cultures has made him a TED talk repeater. His compelling book, The Wayfinders: Why Ancient Wisdom Matters in the Modern World, is transcripts of radio lectures he delivered two years ago. Each chapter highlights his experiences with indigenous people all over the globe, from the aborigines in Australia to remnants of the Incas in Peru. My favorite chapter is about the Polynesians and their extraordinary seafaring navigational skills. When Europeans first encountered the South Seas in the 16th century, they were utterly baffled by how to find their way through this 25 million square kilometer expanse, nearly one fifth of the earth’s surface, and its thousands of small islands scattered everywhere. They ended up traveling routes that kept them close to the shore. 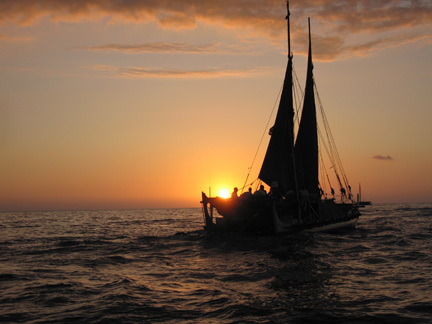 The wind patterns made travel heading east from the Asian continent appear impossible, so subsequent Europeans (like Thor Hyerdahl and his infamous Kon Tiki adventure) held to the belief that Polynesians came from the Americas. And of course the Europeans refused to listen to the “tall tales” of how people from all these island groups were in regular contact with each other and refused to observe the evidence all around them of cultural contact (the famous Kula ring of reciprocity and exchange), sea going canoes, actual individuals who clearly knew a lot more about seafaring than any of the Spanish or French. The myth of progress, the shibboleth of improvement—there is much here that speaks to the ecological damage of that point of view. But there’s something else that has been resonating for me throughout the reading of this book. It speaks to the tension that I outlined in the post just below about the push and pull between the intuitive and the conceptual approach to art making. Our culture has a strong “songline” that promulgates the Cartesian division between the mind and everything else—be it the body, the soul, and/or the spirit. Like the 16th century Europeans who refused to believe that the small and “unsophisticated” Polynesian canoes could possibly travel thousands of miles between South Sea islands, we continue today to eliminate anything from our world view that does not fit with the prevailing map of reality. The nonlinear, the non-measurable, the mystical—all of these entities are fringed into the marginal, rendered invisible and then dismissed. The mass collusion of being unable (or refusing) to acknowledge another point of view happens instantaneously and unconsciously. There are qualities of art making for many of us that do not fit in the linear map of shared reality. There are experiences that we are having that exist in a domain that is not cartographed or languaged. I am not advocating for the invasive linearity of either of those approaches—that would be inviting earth movers to clear cut the verdant rain forest of creative imagination. Rather I am advocating for a world view that has room in its purview for what will always function as Outside—be it indigenous Polynesian wayfinders or a New World 21st century variant.